I am Melvin Rhodes, happily married for 39 years to Diane, and together we have had a lot of wonderful experiences, not to mention three children and eight grandchildren. We have lived on three continents – Europe (UK), Africa (Zimbabwe and Ghana), and North America (USA). I am British and my wife is American but we met in England at Ambassador College in Bricket Wood, Herts., in 1970. 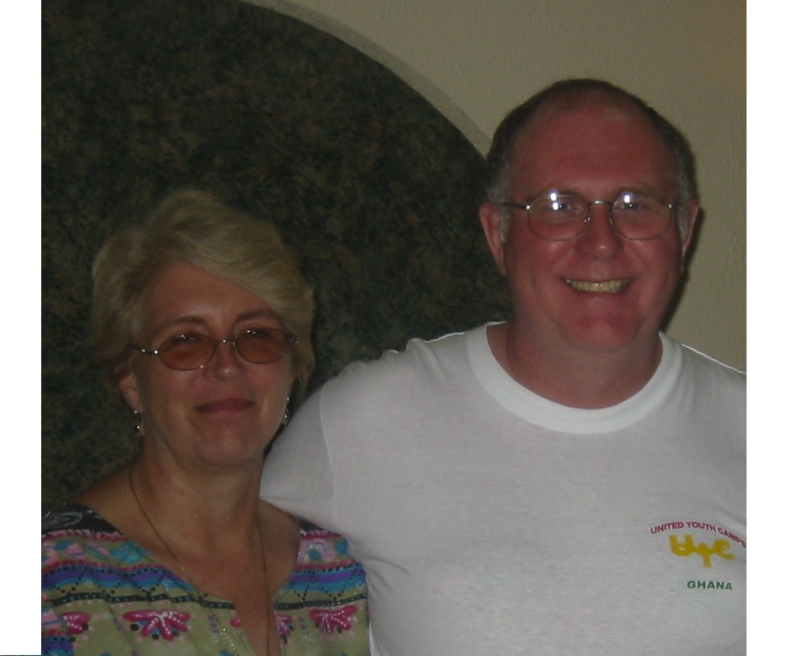 We married in 1975 and moved to Rhodesia (now Zimbabwe). I worked for the Rhodesian government as a District Officer, assisting in the administration of a tribal trustland. I then became a pastor in the Worldwide Church of God. Since then, we moved to Ghana in West Africa, UK, and now Lansing, MI. My wife is from Detroit, so it was like coming home for her, which sounds nice but she spent the first 20 years of her life trying to get out of here! From 1995 we worked for the United Church of God and attend the Lansing congregation. We lived in Ghana through coups, famine, malaria, and a struggling infrastructure (no water, electricity, etc.). And it was the best time of our lives. Our ties there are forever bonded. My father was a communist and from a tender age I was heavily indoctrinated in that philosophy. I had a rude awakening at age 11 when I realized that during the Cuban missile crisis, I was the only one in my class rooting for the other side! That sent me on a lifelong study of history and geography, politics and government and, much to my father’s disgust, I rapidly bolted the communist fold. I like the information because it gives us a look into who you are. I pray that your blog is successful for you, and is helpful and educational for everyone who reads it. I haven’t read any of your blog yet, just the little beginnings listed on the home page. When I get some time I know I will enjoy reading your blog. I’ve always enjoyed learning from your articles in church publications as long as I’ve known you (which I guess has been over 22 years — I read that in your Michigan weather post — BTW I’ve learned that they say the same thing about the weather in Texas, too, and other states — “Wait 15 minutes.”). I hope this blog will open up more opportunities for you. Loved the bit about your father being a communist. My father was a bit of a fascist and I, rebelling, turned to communism. Used to get a mag posted out to me – sort of the Russian equivalent of Readers Digest. It had some great articles about the USSR, a lot of propaganda too, naturally. Anyway, finally realised that communism was also an evil ideology. Hi. So good to read your words again! Best always to you and Diane. Thank you, Mr.. Rhodes, for stepping out in faith to continue your calling by using the talent God gave you to help feed and prepare His people. I totally agree with Phil and April. I missed reading the articles you use to write. God used you with the knowledge you gained by living in so many countries. Also, by being part of God’s true church, God will lead you to write the articles that we so badly need in the times we are facing. I am extremely thrilled looking forward to the enrichment which this blog will afford us through selflessly sharing your talents. Our deep love to you and your family. I was just thinking about you the other day and bemoaning the fact that we were missing your insight and wisdom. Glad to find out you have a blog where you can share with us. Melvin, you don’t have to be an “ordained minister” in order to minister. In a sense, and a very real sense, we’re all called ministers under the order of Melchizedek, and that is our title (God looking at the future like it’s the present), as seen in such in Revelation 5:9-10. Congregations need “pastors” to both nourish and protect the flock. But aside from that, the hierarchal structure of old WCG turned evil, because it was borrowed from Catholicism. The fruits from a bad tree will always end up being bad. The early NT model was semi-autonomous, under the gentle and loving care of a few apostles, who would rather the congregations handle their own problems, and would only give advice at times via Epistle, and stand back and wait for the changes and growth. I think we’ve learned a lot from the past, and yet we need to continue to grow in the grace and knowledge of Jesus Christ, as revealed in the Scriptures. Mr. Rhodes, we miss all of your wonderfully inspired articles. Hope and pray you will WRITE A BOOK about America and Britain and the Bible’s prophetic teachings. We will be the first to purchase one! God’s Blessings to you and Diane. Thank you so much Mr. Rhodes for your dedication to God and His Church. You are a tremendously blessed man of God with talents of understanding and writing about prophecy for modern day Israel. I truly enjoy your sermons online and try to read everything I can find that you author. One of my good friends from the Gadsden Alabama congregation recently sent me your website and he could not have sent me anything more valuable ! Like the Apostle Paul, you and Diane have made difficult trials look almost ‘exciting’. You both are quite incredible, unshakeable examples to a great many of us ‘mere mortals’! Many ‘Thanks’ to you both for your friendship and for giving us the vision of where we should all strive to be in our behavior – expecially with each other. We look forward to continuing to read your very inciteful blog. May God continue to be with you both. I attended Michigan Church when my two kids were young. I.remember when you talk about the country you were living in and money was worthless. Had to carry it around by the suitcase. . you knew prophecy so well. My kids are grown I have a three year granddaughter. I don’t agree what happened to you. I live in Ga now. They keep someone else for making a mistake. But, got rid of you. That a matter between you,your wife and God. Not to have your good name ran through the mud. I don’t attend with UCG. But that is nit why I am staying this. I guess I just feel like there is more to this story. Or UCG would have a different person over Germany. For a person that has sat through your sermon in my late 20′ s . Your know your facts. I just don’t understand. Hi Mel, thanks for this background information. I know you had mentioned your father’s political background, but I forgot that important bit of information. Lisa and I look forward to reading more on your blog. Great blog absolutely a pleasure to read!!! If you can get some polls though for me on Islamophobia by certain regions that would be great. Have a good one my friend!! Melvin, the times that I have spent with you have been very pleasant, interesting and informative. You are one of the most well-read persons I know and hanging around you is an education. I greatly enjoy your informative blog. I’d invite you to come visit us in Tennessee to warm up but recently it’s been too cold here. Still, it’s got to be warmer here than in Michigan so come anytime. In the spring we can sit on the porch and have tea and Lucretia’s whole wheat and honey cookies. Hi Pastor Kellers. You were my first pastor, and you laid the kind of spiritual foundation in me as a new-believer, that not much has been able to shake me for any length of time. Thanks for a job well-done. Attending now in the Worcester, MA UCG under Pastor Len Martin. I know your daughter Alex because she is married to Mike, I like Alex a lot. I don’t agree with most, if any, of your blog but you have a lovely daughter which means you have already done a grand thing no matter where we may disagree! Whatever, the “truth” may be the human experience is a grand one and I don’t pretend to have any of the answers myself. If you like my daughter Alix, that’s good enough for me. We love Mike, too! Great grand kids too. Enjoy! Thank you for starting this blog. We miss your writings and now we will be able to read what is on your mind and what God is leading you to share with others here on your blog. Wonderful! Melvin, me perdí por un tiempo de visitar tu blog, tu enfermaste y estabas complicado, luego vuelvo a visitarlo con la esperanza de que lo hubieses vuelto y aquí estás, me alegro mucho que estes mejor, muchos saludos desde Chile, gracias por tus análisis y escritos! Hello Mr Rhodes. I am very glad I stumbled upon your site. I had found on Craig White’s website a sermon you gave back in 1983 entitled “Africa” in which you went over 7 of the things that held Africa back. It is one of the only sermons I’ve ever heard in which the gentile mindset was so clearly explained, especially when it comes to almost the entire African continent. Your news articles here I find well written and to the point. I look forward to future articles and now consider your site required reading. Thanks for your comments. It was very encouraging to receive your message. You mentioned Craig White. Are you in Australia? Your name is familiar. Have we met? I must remember to listen to the sermon you mentioned. It’s been over 30 years since I gave it. We miss Africa. Sorry for the delay, I just read your comment about emailing you that 1983 sermon. Just right click on the link I provided in my above post and click ” save target as ” and the mp3 file will download to your computer or you can left click on the link and it will begin playing. MR- sir, I have listened and watched you these last couple of years- I REALLY have appreciated your knowledge VERY much. Many areas and I notice you always let who ever is talking to you to finish completely before you respond- That is a smart and wise man, especially of God. I listen and read a lot of the different CoG sites ( I am a former SDA) and have attended many Sabbath groups and churches, but I find you a special teacher/preacher for God’s church. So thankful to “stumble” upon this blog and learn truth. Good to know you have continued writing. Feel connected again and look forward to reading your words. Greetings Melvin and thank you for writing this blog. I was in Amb. College when Steve LeBlanc was a student. I was really pleased to see that Steve had been hired as a ministerial trainee and I know he had some interesting experiences with you in Zimbabwe. I know that you and Steve had at least one miraculous deliverance which I heard about. Thank you for this effort which will help and assist God’s people in understanding the complexities of our world today. Loving greetings in Christ Jesus! Please Holy Sirs, after The Elijah to RESTORE ALL THINGS and so bring back children’s heart to their parents and vice versa until A LAST MASSIVE FALL AWAY, who now according to Holy Pastor Melvin Rhodes is THE HOLY APOSTLE JOHN WHO RECEIVED FROM JESUS AND ATE THE LITTLE BOOK AND THUS IS NOW PROPHESYING AGAIN IN RE-RESTORING ALL THINGS AND RE-BRINGING BACK CHILDREN’S HEART TO THEIR PARENTS AND VICE VERSA?